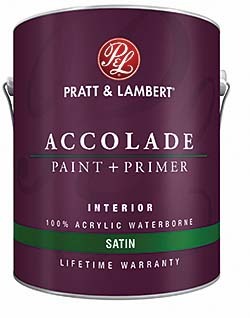 Accolade Interior Paint + Primer is a washable, stain-resistant, 100 percent acrylic waterborne. Can be applied directly to most previously painted surfaces or uncoated drywall. Available in flat, velvet, satin, and semi-gloss finishes. Dries to touch in 30 minutes. Can be recoated in four hours.